Hong Kong people have been enjoying longer life expectancy, thus resulting in various social problems related to health and medical service. Apart from adopting timely social policies, it is imperative to push ahead primary health care through medical-social collaboration and promote a sense of self-prevention of disease and health management among the general public. 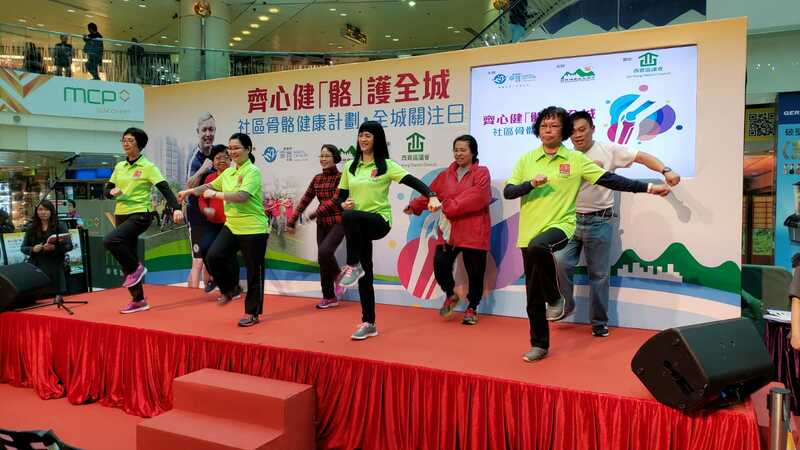 Haven of Hope Christian Service (HOHCS), which has long been promoting health and safe in Tseung Kwan O of Sai Kung District, observes that people generally lacks awareness of bone health. To uphold the mission of preserving Sai Kung as a healthy and safe city, HOHCS joined hands with Sai Kung District Council’s Healthy and Safe City Committee, to hold a bone health awareness campaign titled “Health Bone, Happy Home!” The event was also co-organized by the Social Welfare Department, District Office, Tseung Kwan O Hospital and Housing Department. 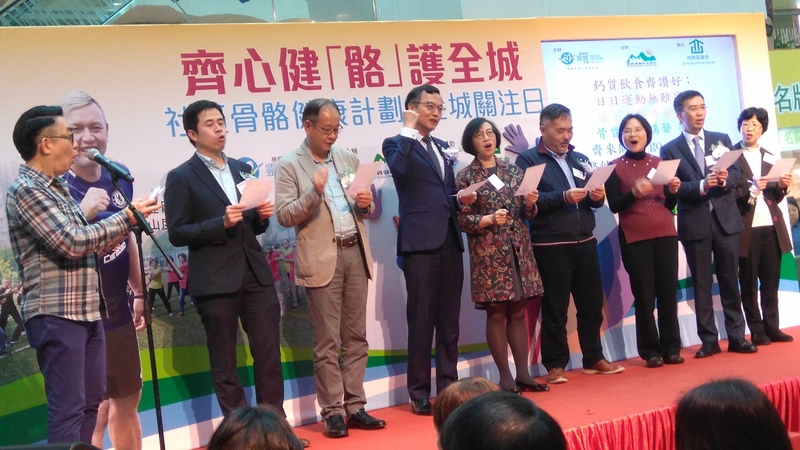 The ceremony of which was drawn to a successful close at the Tseung Kwan O Metro City Plaza on 21 February. HOHCS was honored to have Professor Sophia Chan Siu-chee, JP, Secretary for Food and Health of the Government of the HKSAR, as the officiating guest. Along with other guests, including Dr Ng Sze-fuk, GBS, JP, Chairman of Sai Kung District Council; Mr Stanley Tam Lanny, MH, Chairman of Sai Kung District Council, Social Service and the Healthy and Safe City Committee; Mr David Chiu Yin-wa, , JP, District Officer (Sai Kung); Ms Micy Lui Siu-ying, District Social Welfare Officer (Wong Tai Sin/ Sai Kung); Dr Lau Ip-tim, Hospital Chief Executive of Tseung Kwan O Hospital and Haven of Hope Hospital; Ms Amy Au Chui Hing, Property Service Manager, Property Service Administration Unit (Kowloon West/ Sai Kung Region); and Dr Lam Ching-choi, BBS, JP, Chief Executive Officer of Haven of Hope Christian Service, they left imprints of their hands and made “Health Bone” declaration, opening up a new chapter for the healthy and safe development of Sai Kung District. The guests made “Health Bone” declaration. “Health Bone” exercise was demonstrated by the ambassadors.